Kind Creations: Just Us Girls #447 - Anything Goes! Just Us Girls #447 - Anything Goes! Hi friends! 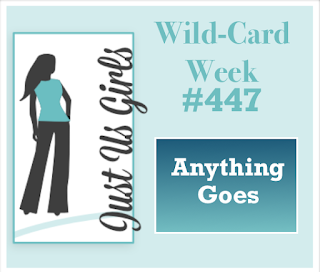 It's the 5th Saturday of the month which means that it's Wild Card week over at Just Us Girls. That means that the hostess, this week Vicki, gets to choose any challenge she wants. Vicki has chosen "Anything Goes" and has offered a challenge to all of you. 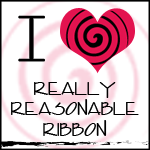 If we have 75 or more participants, Vicki is giving away a prize to a lucky participant. 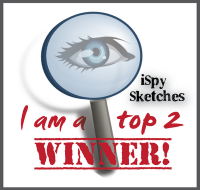 All you have to do is enter and post our graphic on your blog to be in the running for the prize! My LSS is fortunate to have Stephanie Klauck from My Favorite Things teach a class every month. I've been to two so far, but now that I'm retired I can go to all of them. This time, we made two cards and a pop-up card. 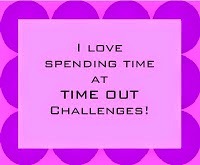 Since this week is anything goes, I can post these for the challenge! All of these mostly used the stamps and dies from the last MFT release. This was the first one we made...a pop-up. MFT doesn't have a die for this box, so Stephanie designed this just from cutting the paper and scoring it herself. I sponged the waves with distress inks and spattered it with water. All of the fish, crabs, greenery, and palm tree were colored with copic markers. These are so fun to make! I was so excited when I found out that we were going to do this next technique that I was itching to try out. In fact, I had on my list of things to purchase at the store the Distress Micro Glaze﻿ to do this technique! I've seen Tim Holtz, Jennifer McGuire, and Amy Rysavy do this technique and it's really cool. You start with Alcohol Ink cardstock (or glossy cardstock) and smoosh the distress oxide inks on a craft mat and spritz with water. Then you smoosh your cardstock into the inks and dry it thoroughly. (This technique will only work with the oxide inks.) I did this about 4-5 times to get many layers of color, picking up the remaining dots of color left on the craft mat. When you finish, there is a chalky finish on the cardstock from the oxide inks and it looks dull. But then you take an ink blending tool with a sponge attached and apply a very small amount of the Distress Micro Glaze on it and sponge it over the piece. 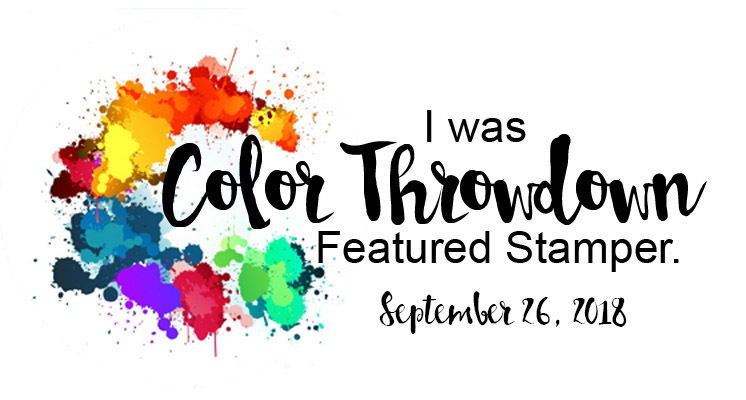 It just comes to life before your eyes and brings all the layers of color forward! It is just so cool! You can see Jennifer's tutorial here. All of these fish, crabs, and greenery took forever to color! I had to do most of them when I got home. These classes with Stephanie are so fun and I can't wait for the next one in July! You can see more from the JUGs design team and our June guest, Hannelie Bester on the JUGs blog. This is her last week with us and we were so happy to have her join us. Her style is just unmatched and so clever. Thanks for joining us this month! How fun! 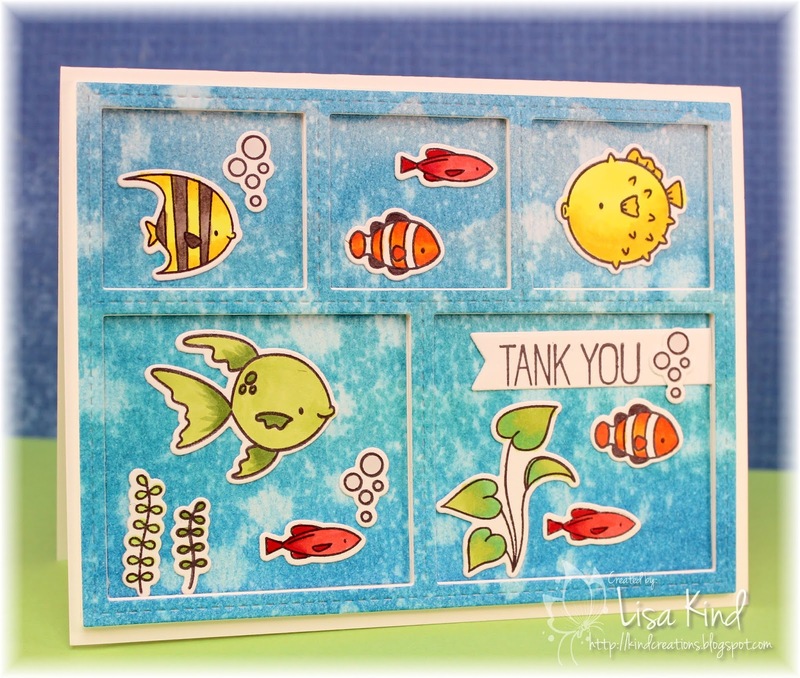 That box of the sea is awesome - love the "water"
Two fabulous creations Lisa. Love pop up cards and this one is so cool! Love the result you get with Tim's Glaze as you certainly get an awesome result. Love that product. 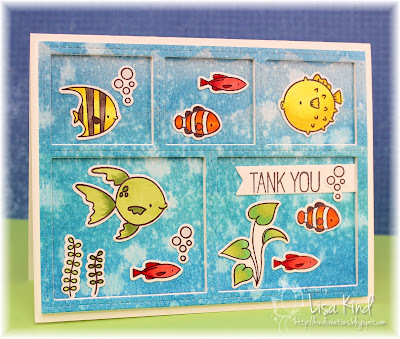 What a lovely underwater scene you created on your second card and the die you used really brings it to life. Both Wowzers! I love that awesome pop up box and the cards, too! Those backgrounds look amazing with so much depth making the underwater scenes come to life! I have some Micro Glaze and now I will try it out after seeing these beauties! What a great post! I learned so much! 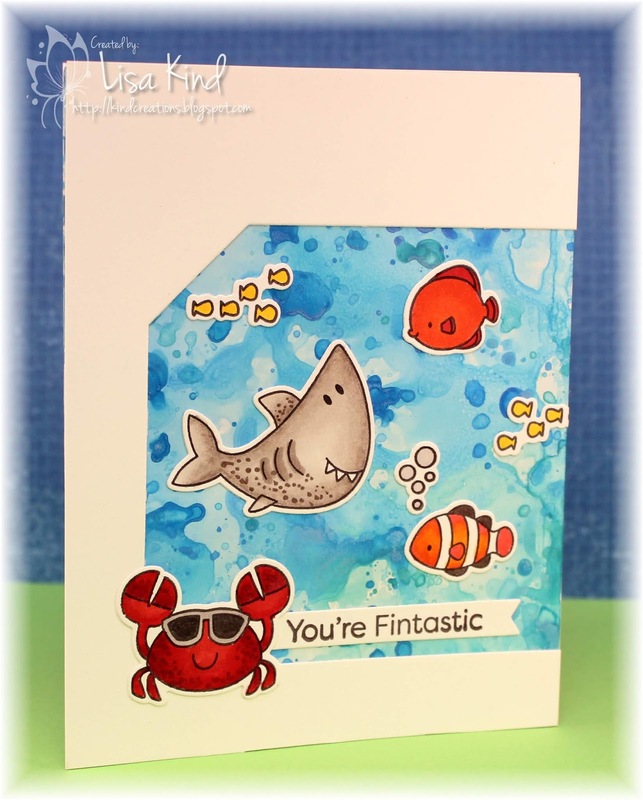 Your box card is amazing and so happy to hear that your local Stamp Store has a MFT designer teaching classes. You are so lucky and now you can go as often as you like! Love the other two cards as well! Have a great day! Wow so many gorgeous creations, love them all! And your pop up is adorable!!! 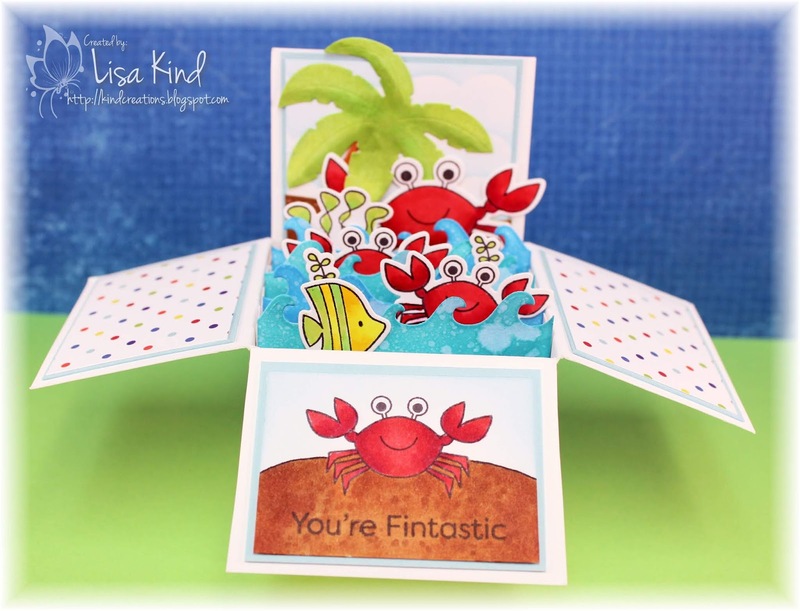 Wow Lisa, these are just such gorgeous and creative underwater creations. Love the vibrant sea colours. It's so wonderful to see all your great designs, Lisa. I can tell by looking at them how much fun you had making them. The pop-up is terrific and must have taken a lot of time. The micro glaze looks like a wonderful technique to try.